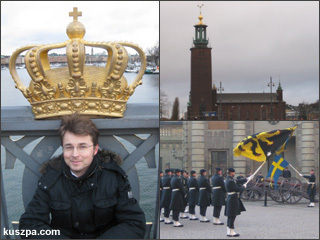 Me, Stockholm City Hall and change of guards at the Royal Palace. It has been a long time ago since my last visit in Stockholm. And there is so much to see in the largest city of Sweden. Runing around in the ‚Gamla Stan‚ (Old Town) and seeing the ‚Stortorget‚ with the ‚Storkyrkan‚ and of course the ‚Riksdagshuset‚ on the ‚Helgeandsholmen‚. A highlight is Royal Palace which is the official residence of His Majesty the King of Sweden. And I was lucky to be in right place at right time to see the parade of the royal guards with military band. Beside the Royal Palace in Stockholm there are also some other royal palaces and plazes that I have to visit next time; Rosendal Palace, Rosersberg Palace, Strömsholm Palace, Tullgarn Palace, Ulriksdal Palace, Drottningholm Palace, Gripsholm Castle, Gustav III’s Pavilion and The Chinese Pavilion. I also went to the ‚Skeppsholmen‚ and of course around the central city seeing e.g. the Saint Jacob’s Church, the Royal Dramatic Theatre and the Royal Swedish Opera. And from the Södermalm you have a great view over the city if you walk along the Katarinavägen from the ‚Katarinahissen‚ towards the Katarina Church – at night the view is impressive.